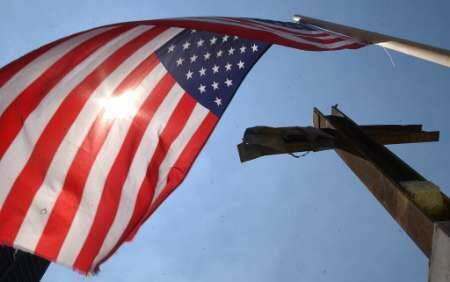 The New American reported: A small Texas town has taken a bold stand for prayer and patriotism. CBS News reported that on June 12 the city council of Weatherford, a west-central Texas community, voted four to one to bring back the tradition of a regular invocation, as well as the Pledge of Allegiance to both the state and U.S. flags, following a 37-year absence of the rituals. Church Street in Weatherford comes to a dead end at City Hall. Tuesday, though, city leaders opened a path for prayer to make its way back into politics. Mayor Dennis Hooks said the desire to be fair to all residents is why he was undecided until minutes before the vote. Resident Bobbie Narramore said it was exclusionary to those who don’t identify with a particular faith. The Freedom from Religion Foundation sent a letter to the city urging it to avoid constitutional concerns. The possibility of a costly lawsuit was what caused Mayor Pro-Tem Waymon Hamilton to be the only vote against the motion. Several other cities including Dallas and Fort Worth have both an invocation and the Pledge of Allegiance before city meetings. This is the best news I’ ve heard in a long while. Finally ,men in an elected Office standing up for Our Lord. You have taken a larger gaint step that Niel Armstrong could have ever dreamed of takeing. You just might have saved this nation for God’s raft. May God bless you with all his kingdom.